If a recipe looks nothing like the one it's based on, is it still an adaptation? If you recall, I was determined to bake what I felt like baking this weekend, something without hangups. There were plenty of things I was considering but I knew early on that it would involve peanut butter :) (surprise surprise). I seemed to keep coming back to these Nutter Butters which were, if you can believe it, the jumping off point for what you see here. When I jump, I JUMP, straight into the deep end. However, next time I should check for water first. To be fair, I had originally planned on making a filling for these cookies, but when the cookies didn't spread much I decided to alter that plan (more). Besides, if I really wanted a filling, simply adding a layer of peanut butter seemed like an easier and better idea :). So where do I begin with this grand experiment? The peanut butter perhaps? As with most recipes that include it, I decided there wasn't enough. But poor planning combined with a terrible memory lead me to replace all of the regular butter with peanut butter. In my mind (heavy emphasis on the “my”) the only solution to a lack of softened butter, is peanut butter. And since I was dreaming of peanut butter cups at the time (something that happens far too often in my daily life), I determined that these cookies should be chocolate. Now if that weren't enough, I reduced the white sugar and eliminated the brown. I was a bit worried the extra sugar from the increase in peanut butter (I was using regular) would be a little much. As well, removing the brown sugar would ensure that the cookies were extra crunchy. Regarding the move to egg white, this is simply because I always have boxed egg whites on hand. Instead of using half of a beaten egg I replaced it with a single egg white (roughly equivalent to half an egg). If you don't normally stock egg whites you should be fine with two tablespoons of a beaten egg. Upon bringing the recipe together it became evident that I had removed too much of the wet ingredients. As I was about to add the oats I thought, hmmm that looks pretty crumbly, buuuuut I do like oatmeal. Caution to the wind, I added them. The results were something closer to breadcrumbs than cookie dough. What to do? I have peanut butter, I have chocolate, and I have oats. Experience has taught me that in a situation where too much of any of these ingredients has been consumed or prepared, the answer is always milk (it does a body good after all). Two tablespoons later, the dough came together (got milk?). 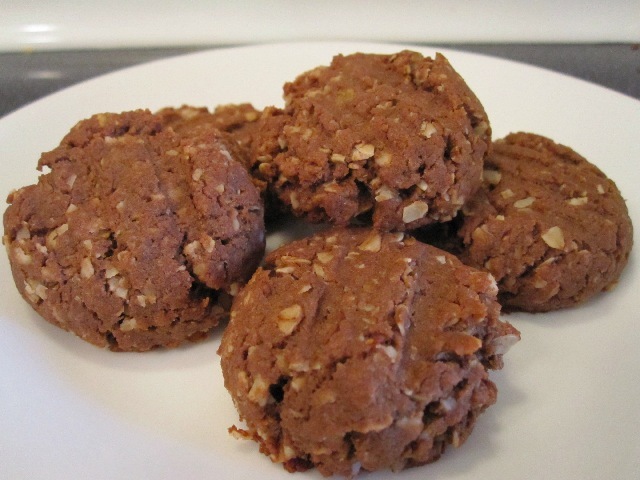 When done the cookies had a great outer crunch, a softer center, and the distinct flavour of both dark chocolate and peanut butter with just the tiniest bit of chew from the oatmeal. There is enough chocolate so they don't seem like peanut butter cookies, but enough peanut butter to stifle the bitterness of the chocolate. They were not at all sweet, in fact, I think some type of icing to lighten up the flavour might be great; perhaps with white chocolate? This is another cookie that I think goes very well with a tall glass of milk or a good cup of coffee. They might not be for everyone and they might not blow your mind but they are quite tasty. And when you've destroyed one recipe to create another, what more can you ask for :)? I'm calling this one a success. Yields approx. 23 2 inch cookies (I used this cookie scoop). Preheat oven to 350F and grease two large cookie sheets. In a small bowl add flour, cocoa powder, baking soda, and baking powder. Whisk to combine, making sure to break up any small chunks of cocoa powder (or alternately sift cocoa powder). In the small bowl of a stand mixer cream together peanut butter and sugar until fluffy and pale (approximately 3 to 4 minutes). Add egg white, vanilla and salt and mix on medium speed until combined. Reduce mixer speed to low and slowly add flour until completely combined. Add oats. Dough will become crumbly and separate, add milk one tablespoons at a time to bring dough together. Spoon by rounded teaspoonfuls onto prepared cookie sheets and using a fork press into a disk. Bake for 10 to 12 minutes (cookies will not spread much, I found 11 minutes to be the best time). Remove from oven and allow to cool on cookie sheet for 2 to 3 minutes before moving to rack to cool completely. One note on storage: If you want the cookies to stay crunchy do not keep them in an airtight container. 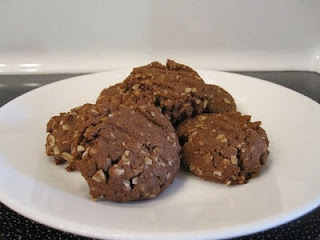 I am definitely still planning on trying the Nutter Butters (they look too good), and I'm also looking forward to reading any impressions you have about the more precise recipe you linked to. Hopefully the next time I try to bake them though I don't lose my mind and do something crazy again :). Next time I might not be so lucky with the outcome.